Kasso x Rain x Demer x Ras VS Crew in Full Effect!! Not Sure if the video shows it but it was cold as hell out there! Here’s what you can expect next Saturday. -Prize packages that include: Jackets from Under Armour ($500), a snowboard from Launch designed by legendary graf writer Pose2 ($1000), goggles from Electric ($100), gloves and backpacks from Turbine ($200), helmets from Bern ($200), headphones from Skull Candy ($100), bindings from Technine ($200), and of course CASH MONEY!!! -THE BATTLE BELOW ZERO mic battle which will feature some of the nastiest MCs on the east coast competing for the shot to open for SLICK RICK the RULER! 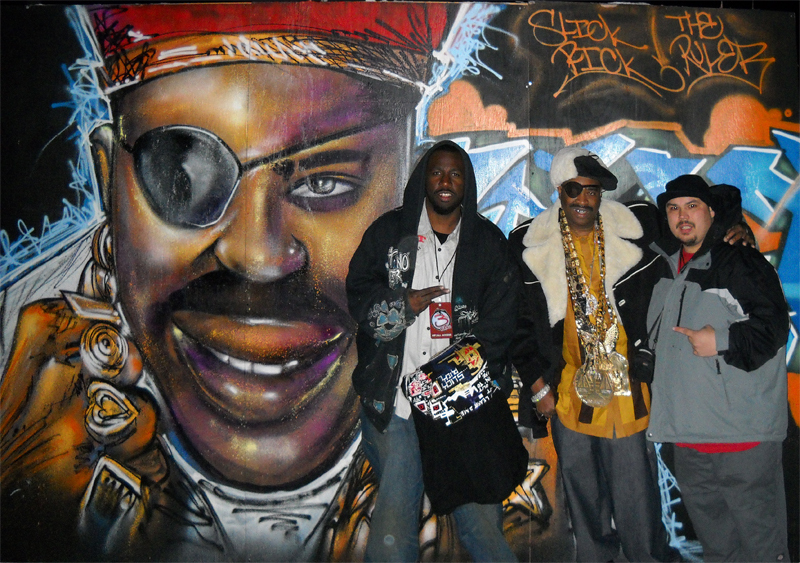 and of course, his divine majesty, SLICK RICK THE RULER!!! NEWS FROM THE EAST SIRE!! SLICK RICK THE RULER HAS RETURNED AND HE IS COMING with the 3RD RAIL JAM!!! If you want to ensure yourself a spot in the jam, the battle, or at the afterparty you need to go to http://www.facebook.com/l/12dc8;www.3rdRAILJAM.com and sign up!!! and YO tune into 3rd RAIL RADIO at http://www.facebook.com/l/12dc8;www.Slacker.com/3rdRailJams brought to you by DJ IMAGE!! 3rd rail jam! from 3rd Rail Jam on Vimeo. 3rd rail 2009 promo from 3rd Rail Jam on Vimeo.